The weather forecast for the next few days is terrible. There is a wind advisory out with thunderstorms forecast for tonight. We briefly discuss aborting our trip to Sarasota and instead heading up river to the marina in Bradenton for the weekend. But we only have 20 miles to Sarasota with a reservation on a mooring ball for the next few days. This should be a piece of cake. The winds are gusting to 20 knots as we pull anchor. Once the anchor is up, the strong wind and strong current conspire and drive us into the shallower depths. We soon find ourself in less than 5 feet of water. Holding our breath as we watch the depth sounder go to 4 ft. 2″, we feel IT bumping her way along the smooth sand bottom towards deeper water. Whew!! That was a close one. My uneasy feeling about today has returned. Once out of the Manatee River, we rejoin the ICW heading south. Traffic is heavy today with a 70 foot sport fishing boat close on our stern along with a sailboat just behind him. It is slow go on the ICW with many Manatee and no wake zones. We also have two bridges today which we need openings for. They both open only on the hour and half hour. Combined with a two knot current and wind gust to 40 knots, my uneasiness ratchets up another notch. While waiting on the first bridge to open, we radio the sport fishing boat to let him pass as he travels at a faster pace than us. We are soon thru this bridge and waiting on the second bridge opening. The bridge operator informs us that only one side of the span is operable. My gosh, this bridge is only seventy feet wide. With only 1/2 of the span opening, we have a 35 foot wide path to travel. Idyll Time is 18 feet wide. This gives us 8 feet on each side. Combine that with a 2 knot current and 25 knot wind, this opening could be a real problem. 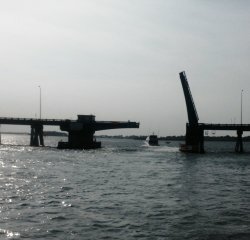 The sport fishing boat calls the bridge operator asking for both sides to open as he is worried about hitting the bridge. 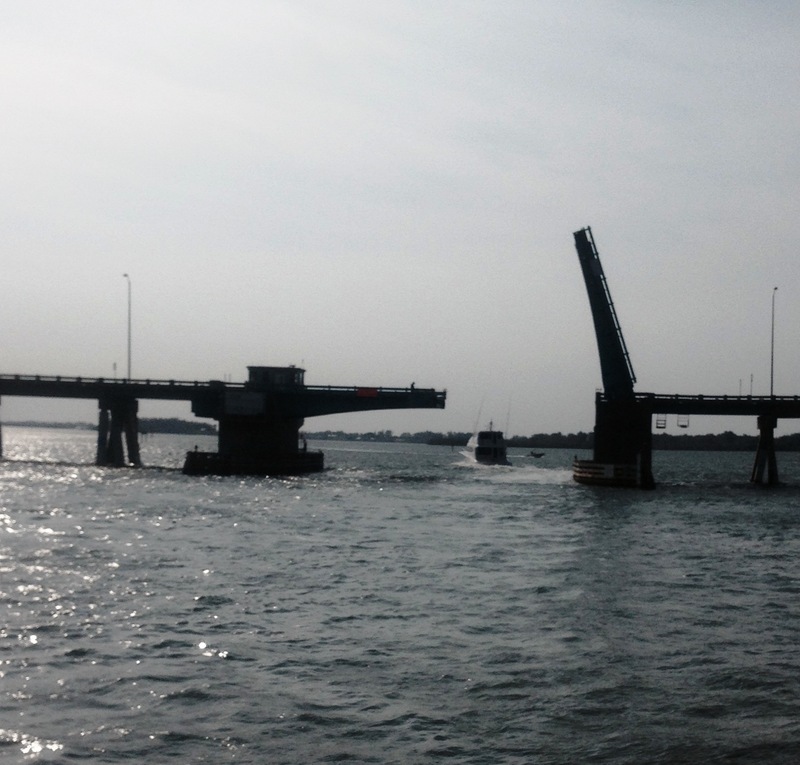 The bridge is being repaired and opening both sides is not an option. After threading the opening with just a few feet to spare, we both make it safely through. That was another nail biter. What else can go wrong? Entering an extremely narrow section of the ICW, we spot the sport fishing boat come to a halt. We think he may have ran aground. Active Captain, an Internet based cruising guide, has warnings out for shoaling in this area. Other boaters have reported deeper water towards the red channel markers on our port. Because of these warnings, we favor that side of the waterway. Just as we see the sport fishing boat start moving again, both of our depth sounders start screaming. We go from 10 feet to 3 feet within seconds. IT bumps the bottom once and is then hard aground. We are stuck. Jeff throws the boat into reverse and tries wiggling us loose to no avail. With three sailboats right behind us, I immediately broadcast on the VHF a Securite warning that we are aground. The sailboats come to a halt and begin circling behind us, not sure what to do. After 10 minutes of attempting to free ourselves from the sand bar, I call Tow Boat US on the VHF. Thank goodness we have unlimited towing with them. They respond immediately and say they are thirty minutes away. After several more attempts at freeing ourselves, IT suddenly moves towards the deeper water. Within moments we are free and back to a 10 foot depth. Canceling the Tow Boat request, we take a deep breath and continue down this shallow ICW route. I just knew today was not a good day to travel. An uneventful hour passes and we soon see the Sarasota mooring field just ahead, our home for the next four days. My stomach is in a knot once again as we see the exposed anchorage. We have to pick up the mooring ball pendant while maneuvering in 25 knot winds. There is a three foot swell in the mooring field with the wind directly on our nose. You couldn’t ask for worse conditions. Surprisingly, I snag the ball with the boat hook on the first attempt. Jeff quickly comes out to assist but he is unable to cleat the line in these winds. We quickly make a second pass and are able to secure to line to the bow. Whew!! That was tough. Because of the thunderstorm and high wind warnings, we attach a second bow line to the mooring ball. These mooring balls are hurricane rated and we now feel very secure. With these winds, it is way to rough to launch our dinghy. We call the Marina and pay for the mooring over the phone. Evidently they were watching to see if we could secure the ball in these conditions. The Marina staff were impressed and congratulated us on our mooring pickup. What a day! I am glad it is over. Our excitement from the previous day continued throughout the night. Around midnight, the winds picked up in advance of an approaching cold front. With the wind howling, we are both awake in the pilot house watching to make sure we don’t drag on the mooring. We see gusts to 40 knots with lightning strikes dancing all around us. Luckily, the worst storms are to our south. The winds continue throughout the following day but have shifted to the north and northwest. The high rise condos help block the wind but it is still to rough and windy to launch the dinghy. Sarasota will wait for another day. On Sunday the winds relent enough to launch Time Out. Sebastian is happy to finally go ashore as we dinghy in to do some laundry and exploration. We have a great lunch at Owens Fish Camp. 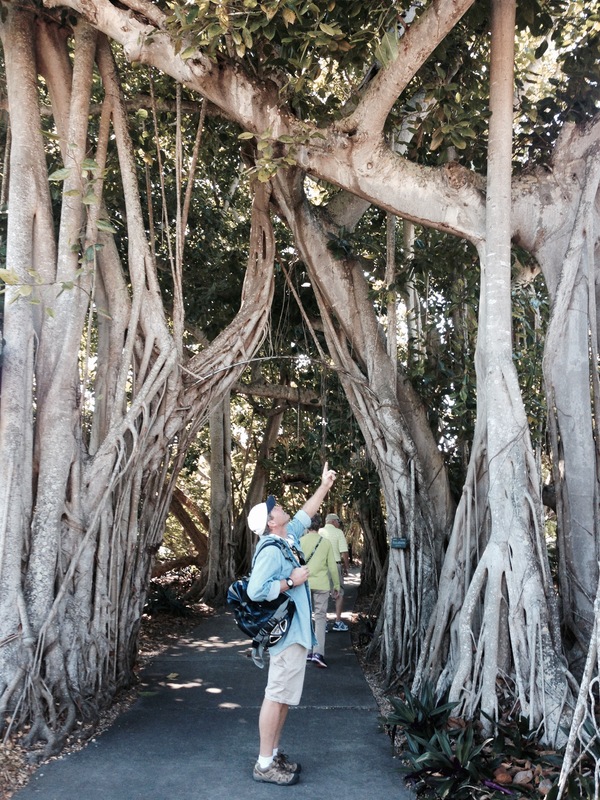 Our afternoon is spent exploring The Shelby Botanical Gardens along the Sarasota waterfront. 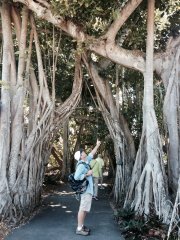 It is very impressive with plants and trees from all over the world. We have enjoyed our short stay in Sarasota and hope to return again next year. The winds have finally released their grip on us and we are underway headed south again early this morning. We make a short trip over to the fuel dock at Marina Jack for some water and a pump out. The temperatures have plummeted overnight and it is again frigid. Sebastian is all snuggled in his blanket wondering when we are going to be in Florida. We have another ” slow go” day with the shallow water and narrow waterway. We catch up with PGP Tour, a 70 foot houseboat, as he is waiting on the first bridge of the day to open. We opt to follow him for the remainder of the day. We could pass him and go a little faster but these shallow depths are very daunting. If we hit bottom again it is best to be going slow. In talking with PGP Tour, we learn that he is a delivery captain and has lots of local knowledge about these waters. We are happy to hear this and follow his line throughout the day. We only have 30 miles to travel today but the trip is long and tiring. Our depths are between 7-9 feet with only 1 foot just outside the channel. We can’t take our eyes off the markers for even a second or we would be aground. There are also 8 bridges that we have to go through today. Some of these open on demand while others open on the hour and half hour. And then there are some that open every 20 minutes. We find all of the bridge operators to be super nice. Each time we pass thru the bridge they wish us a safe trip and also provide us with the name of the next bridge down the water. Their friendliness eases some of the tension that these bridges create. We opt to call it a day around 1:00 as we reach an anchorage known as Cape Haze. Just off the ICW, the anchorage is basically just a small round basin lined with waterfront homes. Their is one other sailboat here but still plenty of room for us to drop the hook. I wonder how all of these homeowners fell about us anchoring in their neighborhood? Carried Away, another Gold looper, arrives a few hours later. This afternoon, we put down the dinghy and take a short excursion over to Don Pedro State Park. This Park is on a barrier island accessible only by water. 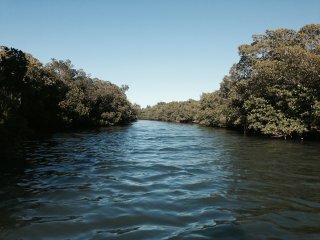 It is a fun but cold dinghy ride through the mangrove channels. Sebastian enjoys his walk along the sandy nature trails. Five thirty finds us aboard Carried Away with Bill and Joyce. We enjoy spending a few hours making new friends and swapping tails of boating adventures. We say goodbye to Carried Away as we leave the anchorage. It is a beautiful sunny day with a light breeze but exceptionally cool temperatures. Our one and only bridge of the day is just head. We miss the opening by a few minutes so have a wait of thirty minutes on this one. It is a little lumpy as we transit Gasparilla Sound. Supposedly these waters are some of the worlds best tarpon fishing grounds. Boca Grand, on the south end of Gasparilla Island, was once the winter resort and fishing retreat for Northern tycoons such as J.P. Morgan. It is now a favorite island for the rich and famous in the entertainment business. Needless to say, we aren’t going there. While admiring these gracious old homes, we hear on the VHF that Boca Grand Bridge, the one we just went through, is now closed until 2:00 PM due to mechanical problems. We are really glad to have made it through before the closure. 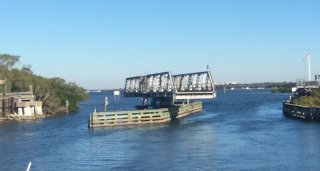 The seas calm down some once we cross the Boca Grand Inlet and the open sweep of Charlotte Harbor. The ICW runs south from here on the eastern side of Cayo Costa Island. It is a Spanish name which means “Coastal Key”. Our anchorage for the evening is just off the ICW channel between Cabbage Key and Useppa Island. A few 100 feet east of the ICW we drop the hook in 9 feet of water. We stay aboard for a few hours to make sure our anchor is holding tight. We always like to do this when we come into a new new anchorage. Once we feel sure IT’s anchor has a secure hold, the dinghy is launched and we head over to Cabbage Key for lunch. The restaurant is a local landmark amongst fishermen. For years they would post a signed dollar bill on the bar walls in order to guarantee a cold beer on their return from fishing. The restaurants claim to fame is a charcoal grilled cheeseburger. Sure enough the dollar bills are still there papering the entire interior. 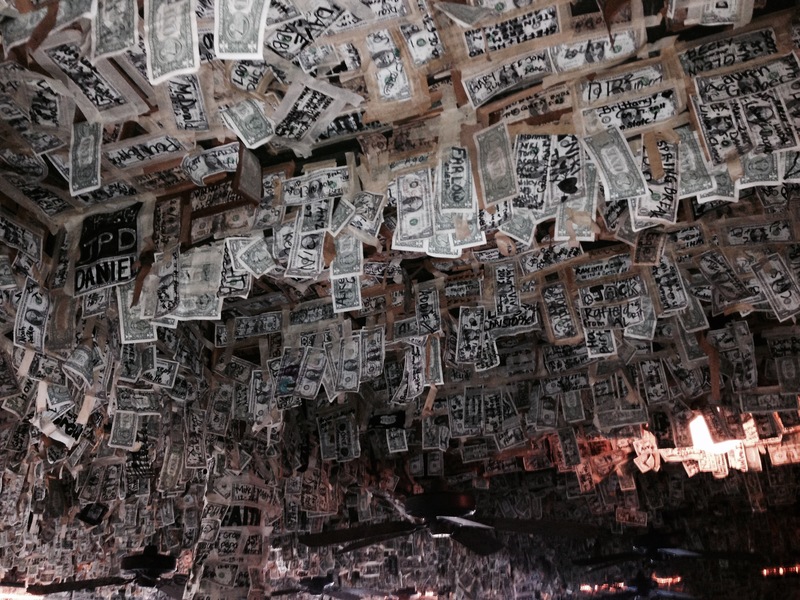 There are over $70,00 hanging from the ceiling and walls.The burgers were good but overrated and overpriced. It is a tourists destination now but someplace everyone should visit once. Back at the boat, we pick up Sebastian for a dingy ride around Useppa Island. The Island is now a exclusive private club for the wealthy. Useppa was at one time abandoned and used by the CIA for training during the Bay of Pigs invasion in 1960. In 2004 Hurricane Charlie destroyed the homes but they have now been rebuilt to their previous splendor. Our dinghy ride is quite pleasant as we marvel at the impressive vacation homes. Back at the boat we enjoy another marvelous sunset. It is a sunny warm day for our short three hour trip to Cape Coral. 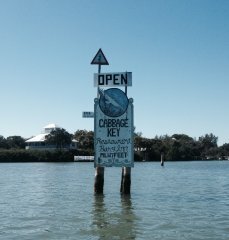 Although our month long reservation at Tarpon Point Marina does not start until tomorrow, we decide to go in one day early. We have a rule to never travel on the weekends as this amounts to what Jeff calls ” Amateur Day”, inexperienced boaters who don’t know what they are doing. It is Friday and it seems Amateur Day comes a day early. As we near mile zero on the Gulf ICW, we find the waterway packed with with small boats going every which way. I feel like we are on I-75 going thru Atlanta at rush hour. 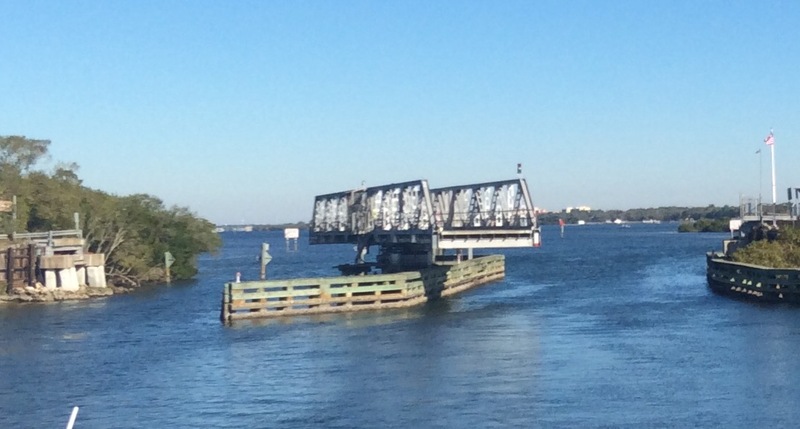 This section of waterway near Ft. Myers is know as the ” Miracle Mile”. Boaters also call it the ” Miserable Mile” due to the large amount of boat traffic. I would have to agree heartily with the later assessment. This mile long channel is only 100 yards wide with skinny water on both sides. Boats come at us from all directions. We hold our ground and stay in the center as we can not venture into the shallow water. Since we are restricted in our draft, we don’t have much room to maneuver. We do have the size advantage so these small boats dart out of our way at the very last minute in this maritime game version of chicken. It is with great relief that we finally spy the Marina turnoff. Tarpon Point Marina will be our home for the next month. 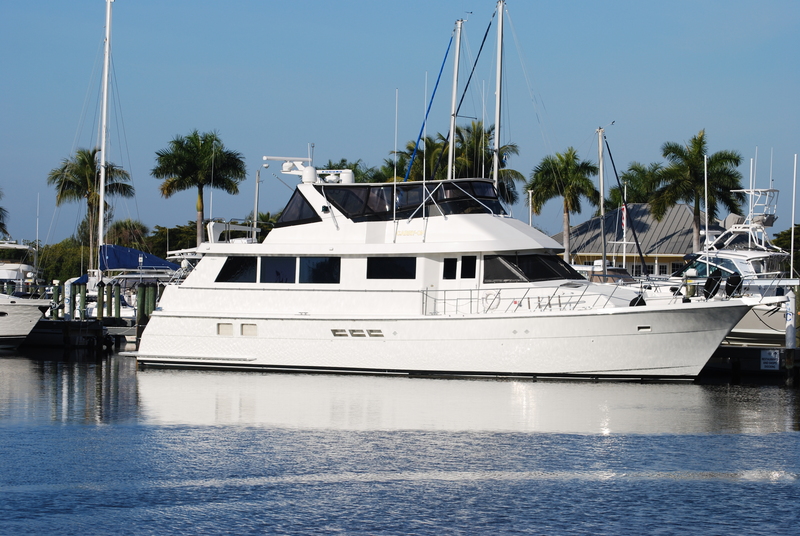 Our good friend, Dean, keeps his 70 ft. Hatteras, Carry On, here. We are looking forward to spending some time with Dean and maybe even getting a chance to take a boat ride on Carry On. The marina is quite nice with several restaurants, high rise condos, and a Westin Hotel along the basin. We are looking forward to a month of shore leave. This entry was posted on February 20, 2015 at 2:57 pm. You can follow any responses to this entry through the RSS 2.0 feed. You can leave a response, or trackback from your own site.